Does anything speak to the heart quite like a good book? 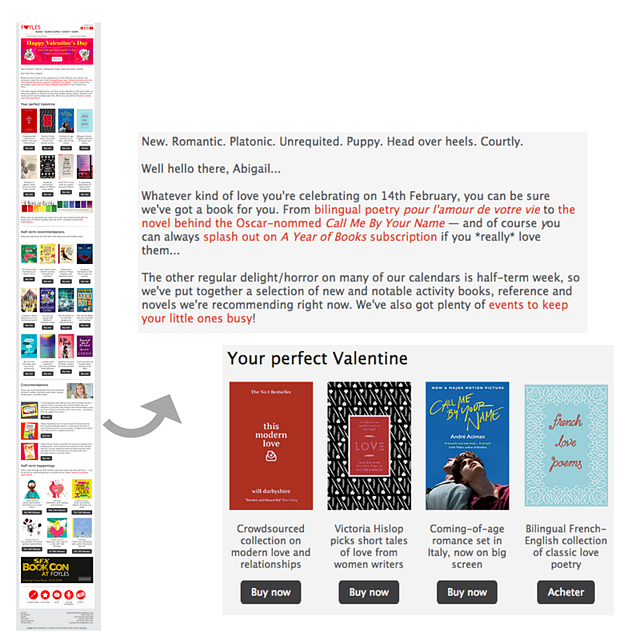 To mark the most romantic time of the year, this email from Foyles not only tweaks the brand's logo (turning the ‘o’ into a heart), but also helps the recipient (Abigail) discover her ‘perfect’ Valentine's Day reads. It’s interesting that the email also includes book and event recommendations for 'little ones', as Abigail has browsed children's books multiple times on the site before. Product recommendations work best when they’re accurate—especially when it comes to selling something as personal as a book. Depending on the engine you use and the amount of customer information available, your recommendations can be based on factors such as a recipient’s browsing behaviour, purchase history, preference centre or wish-list. 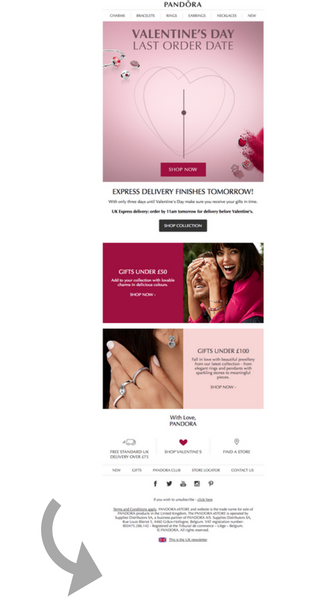 Sent from jewellery giant Pandora, the below broadcast email rings the bell for last Valentine’s-related orders. Open-time personalisation ensures any time-sensitive content included in an email (such as a countdown) updates every time a recipient opens it. This not only makes the overall message seem more authentic, but also avoids any confusion with potential customers about how long they have left to place an order. 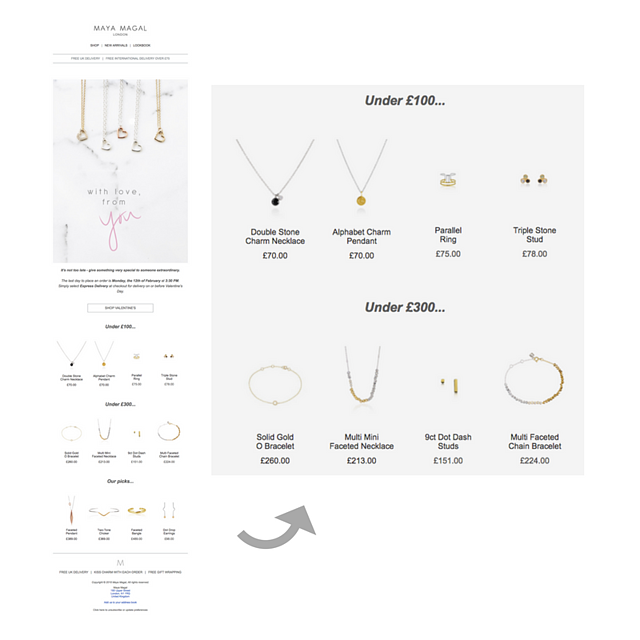 This type of personalisation also enables retailers to always display the most relevant, in-stock product recommendations every time an email is read. London based designer Maya Magal sent the below email ahead of Valentine’s Day, encouraging a recipient to splurge on themselves. By neatly grouping different handmade jewellery pieces by price, it makes it much easier for a recipient to quickly locate something they like within their budget. Like all of these emails, this message has been sent to a recipient with no purchase history; if you do have this sort of customer data available, it’s worth tailoring the products you display according to what you know about each recipient’s taste and spending habits. 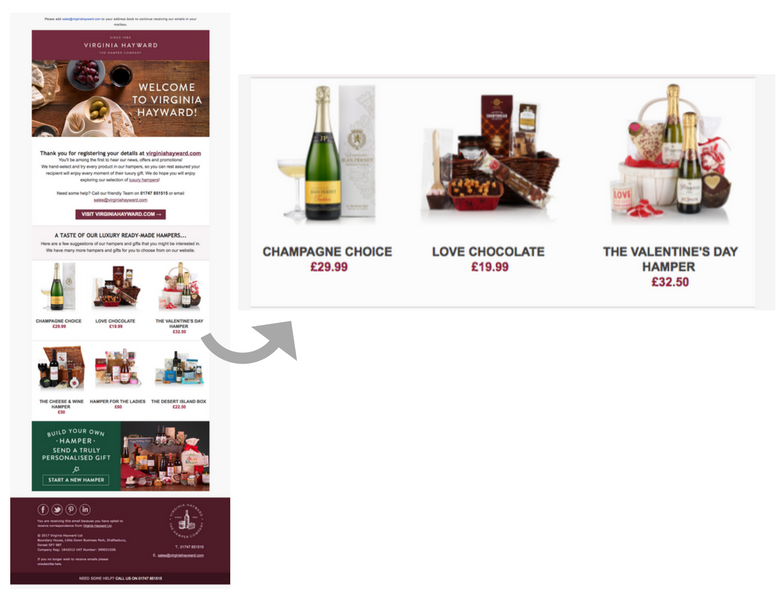 Top tip: If you offer lifecycle-based incentives (for example, first-purchase discount), use dynamic content blocks to incorporate them into any Valentine's Day mailouts. As we all know, including engaging, timely and on-brand content in your email marketing is a great way to engage a recipient and show off a bit of your brand personality. This is something Villoid (a ‘mall of boutique shops lovingly stocked by the world’s most stylish gals’) does consistently well. Ahead of February 14th, the self-confessed ‘style geeks’ sent out the below ‘gift': a cherry-picked list of Valentine’s Day themed goodies which, once clicked, take a recipient straight to the checkout. If you’re a brand that takes its content seriously, bear in mind who each of your customers are and what they’re likely to want to hear about. For example, if you sell both menswear and womenswear, try to determine which range a recipient is most interested in (this might well be both) instead of just taking a guess and ending up baffling them with a totally irrelevant newsletter. We’ve written about this online magazine-meets-concept-store a fair bit in the past, but that’s because it just gets cooler with age. Semaine has become famous for its colourful, artistic email marketing, and its Valentine’s edit is no exception. But this email isn’t just a pretty face; as a quick read of the copy below the flashing gif will tell you, the brand is marking the occasion this year by offering carefully curated hampers and - wait for it - hand-delivering them to all London-based customers by bike. We said they were cool. Location-based personalisation is impressive, but can fall flat if you send it to the wrong people. Use any geographic data available to ensure any special campaigns such as the above are only sent to the right customers (or at least acknowledge the fact a recipient isn’t based in the city when talking about the special initiative). Valentine’s Day isn’t for everyone - that’s a fact. But it is a great opportunity to have fun with your email marketing - mixing up the conversation you have with your customers and showing a bit of your personality at the same time. 🌹 If you’re a brand selling gifts, this is your chance to shine. It’s worth sending a dedicated Valentine’s Day broadcast email to your contacts, reminding them of what you have to offer this time of year. 🌹 Gift retailer or not, take a look at everyone who shopped gifts this time last year and send them a targeted email encouraging them to shop with you again. 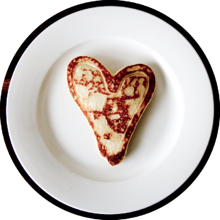 🌹 Again, whatever your product offering, tweak your emails (automated or broadcast) to include a sprinkle of Valentine’s themed content—this could be a love-themed product recommendation, dynamic content block reminding recipients of any offers, promotions or shipping deadlines or timely content (e.g. a blog posts about the best rom coms to watch on February 14th).